​I wonder how many of you recognize the words of the title of this blog post? If you said it was from the song ‘Signs’ released by the Five Man Electrical Band in 1970, you’d be right. Those lyrics have some significance to part of one of the meetings I attended during this past month. April was just as busy as the previous months have been so far. My total meeting count this month was 11 meetings attended, one missed due to a conflict and another one was cancelled. There were a total of three public Town Council meetings this month. The two regular ones on April 1 and April 15 plus a Committee of the Whole meeting on April 10. It was during the first regular meeting this month that a design for new street signs was revealed (here’s the segue from the opening of this article). Town Council chose to follow the recommendations made by staff to pick white reflective lettering on black instead of black lettering on a white reflective background. The mock-ups presented at that Town Council meeting included the Town of Princeton logo on each street sign. I found the logo hard to read and understand in such a small space that would be suspended about nine feet off the ground. So I suggested that the logo be replaced with block numbers to assist first responders. I noticed this was how street signs in Oliver appear and I liked the look. The suggestion was approved unanimously. Our Committee of the Whole meeting, which was also open to the public, featured a presentation from Joel Short of Urban Systems. Town Council is exploring ways to implement development fees to help fund infrastructure improvements and the presentation gave us a lot of things to consider as well as options. Whatever path we choose, it will have an impact on future development in the community. The end of April will include an interesting event for me. From April 29 to May 3 I will be in attendance at the 2019 SILGA (Southern Interior Local Government Association) Convention in Penticton. I have signed up for several workshops that relate to my portfolio with a focus on economic development, downtown revitalization and involving local youth. I will be one of three Princeton delegates at SILGA and look forward to days of guest speakers, presentations and getting to know more local elected officials in our region and the rest of the Southern Interior. 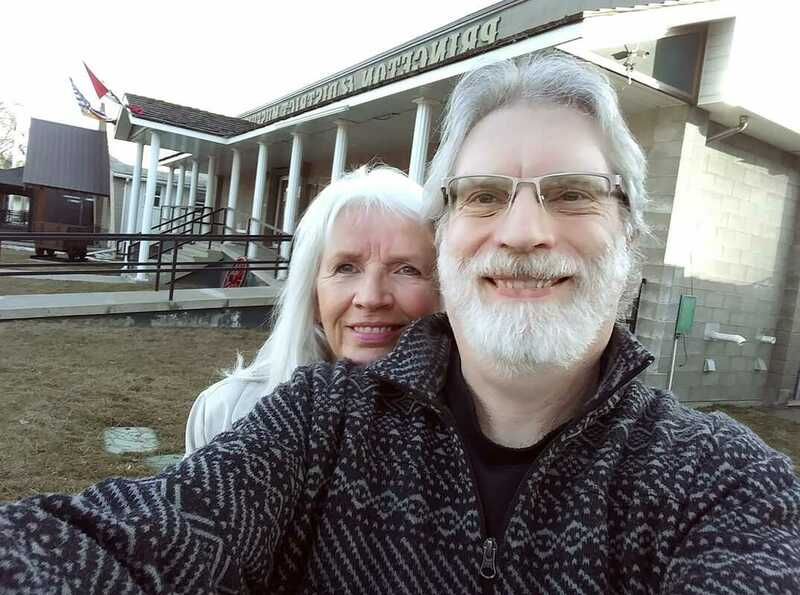 Brenda and I just prior to the Princeton Museum AGM on March 21, 2019. ​When I used to sit opposite of Town Council in my radio and newspaper reporting days I often wondered one thing. I used to try to imagine the juggling act that a full-time employed person or business owner would have to perform in order to be an effective member of a local government. I am getting a quick education on the demands of elected officials just four months into this term. What I have learned is that the workload of meetings has to be fit into a schedule that also allows for work, family and personal time. Nobody said it was going to be easy but early on, I can see why a lot of retired or semi-retired individuals tend to be nominated and elected to represent their community. For me, my schedule is pretty flexible but a few years ago it would not have been. As I am a full-time work-from-home entrepreneur, I’m usually quite capable of fudging my timelines to squeeze in last minute meetings. I also have two days a week that I have purposely designated as being reserved for personal time. It gives me the opportunity to spend quality time with my wife and with friends. All of this is apart from my political life and has to be. As for my daily workload, it really depends on the particular job I am working on. As a full-time freelance writer/ghostwriter, all of my work activities are exclusively dealt with online. I have different deadlines for each and every project. Thanks to my radio/newspaper past, deadlines are something I’m rather good at working with. So, my work is never disturbed as a result. There were two regular meetings of Princeton Town Council. Monday, March 4 and Monday, March 18. Probably the big news items to come out of those meetings were the awarding of the new Landfill Contract and Curbside Pick-Up Contract. As far as I’m concerned, the real news from this month was the appointment of Lyle Thomas as our CAO. He had been filling the position as an Interim CAO since October. It’s not often that I can take my wife, Brenda along for a meeting or event. The Princeton Museum AGM provided a short social hour prior to the meeting where Brenda got to visit with a few close friends and casual acquaintances before the business portion of the meeting began. We tend to forget that our ‘partner’ is also part of our political life and I’m trying to include Bren in things I think she’ll find interesting and enjoy. What I liked most about the Museum AGM was that I had an opportunity to speak briefly as the past President on a number of highlights from my less-than-a-year in the Chair prior to getting elected to Princeton Town Council. My first mention was the volunteers. I know the price they pay in our community working hard to keep their facility vibrant. I also got to conduct the Election of Officers. It was a great evening enjoyed by all in attendance. ​For many years I used to view February as a transitional month. You know, it’s shorter than all the other eleven months of the year and it sort of got wedged into the last part of winter just before spring. I saw February as the month that made winter seem to pass by a little bit quicker. It also was short enough that you really couldn’t get much done in it before it was over. Well, let me tell you that I now have a far different perspective on February. So far in my term on Town Council it has easily been the busiest month so far for me. I had a total of 15 meetings scheduled throughout the month. Three of them I actually could not attend as there were conflicts with other meetings. This was the first time I had to choose between meetings. Let me try to give you a snapshot of my February. We had two regular meetings of Town Council. They were on February 4 and 19. One of the most interesting things we discussed was to explore the viability of DCCs. A Development Cost Charge is essentially a mechanism that is used for recovering costs associated with infrastructure expansion. The costs are usually passed on to the developers in one of many different ways. Of interest out of this list of activities I still managed to work my home-based business activities around this schedule. So far, I have noticed a bit of a pattern developing where there will be one week that contains several meetings followed by a week with maybe one or none. This seems to repeat where every other week is a slower one where I can catch-up on client tasks.